Planet Aid has recently placed 10 donation boxes in the Bangor area. 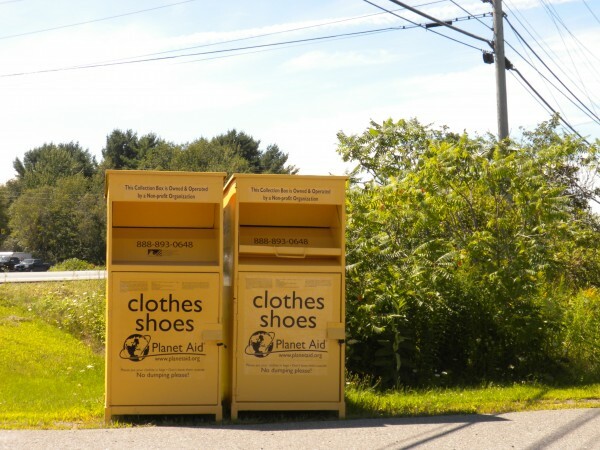 BREWER, Maine — A few weeks ago a large yellow metal used clothing and shoe collection box was placed at Gunn’s Sports Shop to benefit Planet Aid, Inc., a nonprofit organization that supports programs in 15 underdeveloped countries, and recently expanded into the Bangor area. The nonprofit’s website says it has donated more than $68 million to underdeveloped countries all around the world since its first collection box was put out in Massachusetts in 1997. But some media reports and a British watchdog group question its legitimacy among the world’s clothing collections charities due to links to a mysterious Danish cult and an “F” rating by Chicago-based philanthropy watchdog agency CharityWatch, which says it spends too much on administration and not enough on its charitable programs. “There is a lot of misinformation out there about us,” Tom Meehan, chief financial officer for Planet Aid, said earlier this month from the organization’s Holliston, Mass. headquarters. Planet Aid collects clothing donations from more than 16,000 collection boxes all around the country — 367 in Maine, with 10 new boxes in the Bangor area — and sells the items in bulk to markets in Eastern Europe and Africa. A portion of the funds pay for long-term community development programs in areas of the world where “the population doesn’t really have anything,” Meehan said. The controversy around the nonprofit centers around its connection to the Danish-based group Tvind that was formed in the early 1970s by schoolteacher Morgens Amdi Pedersen and others, and by 1977 had established The International Humana People to People Movement. Planet Aid is a member of the Humana People to People Federation, the organization’s website states. British journalist Mike Durham, who is based in London, said in an email interview with the Bangor Daily News recently that Tvind is a moneymaking global conglomerate masquerading as a humanitarian organization. Durham created a watchdog website, tvindalert.com. Planet Aid spokesman Jonathan Franks, managing founder of Lucid Public Relations, said that much of Durham’s reporting is misleading. “Not a lot of it is true and not a lot is researched,” Franks said of Durham’s website. The Danish government tried to prosecute Pedersen and seven others in his inner circle, a group called the Teachers Group, for tax evasion and fraud a decade ago but only one — Sten Byrner, Tvind’s financial director — was convicted after a three-year trial that ended in 2006, several media sources reported. Byrner received a suspended 1-year jail sentence and the rest, including Pedersen, were acquitted. “A very small number” of Teachers Group members are board members for Planet Aid, Franks said. A board of six people, led by Chairman Mikael Norling and President Ester Neltrup, run the organization, according to the Planet Aid website. Franks added later that only about 1 percent of Planet Aid’s approximately 350 employees are Teachers Group members. “What we tell people is, and it’s always hard to understand, the Teachers Group-Tvind group really have nothing to do with the operations of Planet Aid at all,” the Planet Aid spokesman said. The Boston Globe reported in 2002 that Neltrup was a Teachers Group member, and that Planet Aid was a spinoff of Tvind, but the nonprofit’s spokesman denied the claim, saying, “It’s definitely not an offshoot.” The Globe report sparked a number of follow up articles in newspapers and magazines and on television news shows wherever the yellow collection boxes showed up, with most focusing on Planet Aid’s connection to Peterson and the Teacher’s Group or their bad rating with CharityWatch. Franks said whenever people ask about where the money raised is spent, he points them to the organization’s yearly financial documents which are posted on the Planet Aid website and include the annual IRS reporting form for charities, Form 990. He added that Planet Aid has been audited by the IRS twice in recent years. An IRS representative said he could not discuss whether a person, business or nonprofit was audited or the results of any IRS audit for privacy reasons. Planet Aid is registered a 501(c)(3) charity and is exempt from federal and state taxes. Meehan provided the Bangor Daily News with a copy of the 2012 financial audit for Planet Aid issued in June, which shows the nonprofit had a $40.4 million operating budget, up from nearly $37 million for 2011 and in 2012 collected $38.4 million in revenue from clothing sales, up from about $31.4 million in 2011. Federal contracts decreased in value from about $5 million in 2011 to approximately $3.8 million for 2012, and donations stayed about the same at $659,00 for 2011 to $700,264 in 2012. The amount allocated to international aid, according to the audit created by Westborough, Mass.-based accounting firm Alexander, Aronson, Finning and Co., increased from $9.98 million in 2011 to $10.7 million for 2012. The aid issued in 2011 went to training teachers, $3 million; community development for poor youth, $3.2 million; health programs to address disease disorders, including AIDS-HIV, $2 million; and $2 million for agriculture and rural development programs to address nutrition. The auditor said there were similar allocations for 2012. Payroll increased by about $2 million between 2011 and 2012, with $12.3 million paid to Planet Aid employees and executives for 2011 and $14.3 million paid in 2012, the audit shows. The payroll costs of collecting the clothing, which makes up the majority of the wages, also increased by about $2 million, increasing from just under $9.3 million in 2011 to $11.3 million for 2012. General and administrative payroll costs hovered around $3 million for both years. In addition to salaries for the 350 or so employees, Planet Aid also pays contractors — $381,275 in 2012 and $1.6 million in 2011 — to empty the boxes and transport the goods to the nearest warehouse. Maine has one warehouse, in Gardiner. Planet Aid spent around $20 million on collecting and reselling the used clothing and shoes in 2011 and $23.3 million in 2012, but classifies the costs as expenses for running a service program — its “U.S. clothing collection and habitat protection” program — since reusing clothes cuts down on environmental conditions created when new clothes are manufactured, and because fewer garments end up in landfills, the Planet Aid website states. “By collecting and reusing clothes, we are benefitting the environment,” Meehan said. The accounting practices of Planet Aid are why CharityWatch gave the organization a failing grade. CharityWatch says only a small portion of the funds raised by Planet Aid are distributed to the needy. CharityWatch, an independent, nonprofit watchdog agency based in Chicago, has been watching and criticizing Planet Aid for years. The watchdog group, formerly known as the American Institute of Philanthropy, gave Planet Aid an “F” rating in their May-June newsletter. The big difference in the figures is that Planet Aid categorizes the collection boxes and other collection costs as service program expenses, along with international training and international aid, and CharityWatch says those expenses should be considered fundraising. CharityWatch’s benefit target for nonprofits is to spend 60 percent or more on charitable programs. Planet Aid also writes off an estimated environmental benefit for donated display space — including the corner of Gunn’s parking lot — and calculates for “contributed use of land” at 1 cent per pound of clothing collected, the audit shows. The value recorded for 2012 was $189,729 and it was $442,767 for 2011. Franks said the nonprofit has earned the trust of two major supporters in the U.S., one being the U.S. government. The U.S. Department of Agriculture is partnering with Planet Aid to feed and teach schoolchildren in Mozambique about how to plant and raise a school garden, and provide teacher training about incorporating gardening into classroom curriculum under the McGovern-Dole Food for Education and Child Nutrition Program. The USDA program is a three-year, $20 million grant issued to Planet Aid in April 2012. Planet Aid is also partnering with American Soybean Association’s World Initiative for Soy in Human Health or WISHH program to help provide nutrition education to 1 million Mozambicans, she said. Planet Aid’s Food for Progress program in Mozambique also helped support construction of the One World University, to train instructors for rural teacher training colleges, and the project in Malawi has supported the construction of a new teacher training college, Klusaritz said. As part of the USDA’s Foreign Agricultural Service’s regular evaluation process, a compliance review of Planet Aid was conducted this year and and did not identify any irregularities in program implementation, the USDA spokeswoman said. The review included checking participant performance and financial reports against a sampling of receipts from program expenditures, as well as reviewing independent financial audit reports to identify any significant issues or material weaknesses. The grants to Planet Aid include commodities, ocean transportation and cash for administrative expenses, Klusaritz said. “It found that Planet Aid was fully compliant with all of the terms and conditions of its agreement with USDA,” she said. The United States Agency for International Development also awarded 112.6 metric tons of prepackaged food to Planet Aid in 2012 and 93.8 tons in 2011 that was distributed in Zimbabwe, the audit from Meehan states. People are also doing their own research. “In the era of smartphones and the era of Google, they are able to do research and they still make donations,” Franks said. Planet Aid did get into trouble in Maine in 2008 because it put out collection boxes but did not have the required state permit to operate as a charity, and ended up paying a $7,500 fine, according to the state’s Agency License Management System. Meehan said the mishap was just a rookie mistake. The permit issue was rectified in 2008, and a five-year permit was issued and is current until the end of November, the state’s license management website states. Mike Merritt, manager of Gunn’s in Brewer, said he first noticed the yellow boxes when visiting friends in southern Maine and didn’t give it a second thought when approached about putting one in the corner of the parking lot. The new yellow boxes in Bangor and Brewer are filling fast, Franks said.